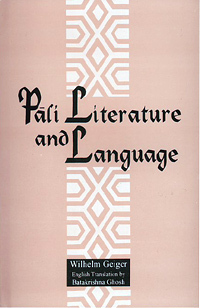 This English translation, by Batakrishna Ghosh, of Professor Geiger's "Pali Literature und Sprache" offers more than the German original. Much new material has been supplied by Professor Geiger himself. Wilhelm Ludwig Geiger (21 July 1856 – 2 September 1943) was a German Orientalist in the fields of Indo-Iranian languages and the history of Iran and Sri Lanka. He was known as a specialist in Pali, Sinhala language and the Dhivehi language of the Maldives. He is especially known for his work on the Sri Lankan chronicles Mahāvaṃsa and Cūlavaṃsa of which he made critical editions of the Pali text and English translations with the help of assistant translators.